i love breakfast food, but can't eat at 6am before i leave for work. so, Thomas and i try to have breakfast foods for dinner every now & then. lately, we've been trying to make our dinners more healthy, so a lot of breakfast foods are out! however, my dad makes these english muffin breakfast sandwiches occasionally, and we decided to try them out for ourselves. we doctored up his recipe a little bit by using egg whites and adding turkey bacon to the sandwich. it turned out super delicious - i think this is the best combination of healthy breakfast foods! these sandwiches really take breakfast for dinner to the next level! plus, you can freeze the leftovers for grab-n-go breakfasts for the rest of the week. so really it is a win-win. by the way, did you know they sell already separated egg whites in the store? it is more expensive than buying eggs and separating them yourself, but there is less waste this way & it's quick! Butterball also makes pre-cooked turkey bacon. i didn't use it this time because i couldn't find it at the store i went to, but that is definitely an option! - cut up the spinach & roasted red peppers into bite size pieces, then mix with the egg whites in a bowl. - heat up pan & cook eggs like an omelet. - while cooking the eggs, toast the english muffins and microwave the turkey bacon according to package instructions. 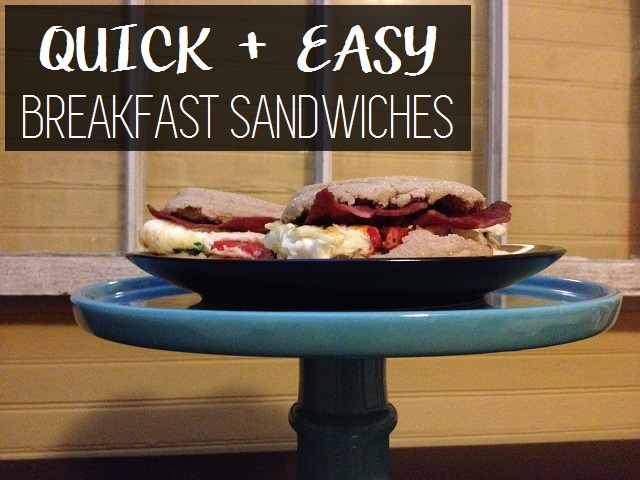 - cut the eggs into sandwich size pieces and assemble on the english muffin with turkey bacon on top. a good compliment to this breakfast sandwich would also be homemade turkey sausages, if you are not a fan of turkey bacon. the sausages would be great mixed in the eggs or served on the side! what's your favorite breakfast for dinner menu?